Multi strand necklace designs are a wonderful accessory for a low scoop neck dress or blouse as well as other fashions. If you've never worn a multiple strand necklace, then you're in for a real surprise. Many people fear this kind of necklace will feel too heavy to wear comfortably. The majority of these necklaces are lightweight and give a beautiful cascade effect that is very pleasing. 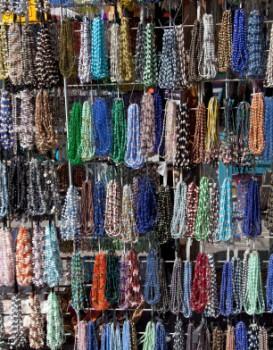 There are many different styles of multi strand necklace designs made out of various materials. With such a vast variety of choices available, you'll be sure to find something you'll like. This style of necklace can be versatile, Unlike single strand, a necklace with several strands can help to add color and balance to fashion. A necklace made of multiple strands can also be an opportunity to create contrast or give greater texture to your overall outfit. Exotic seeds have been used historically for their bright colors ranging from reds, oranges, yellows, and sultry browns. Almost every culture has a history of seed jewelry and seeds being used as decoration sewn not clothing and even shoes. Ancient cultures adorned their clothing with designs made from seeds. In the modern world, many of the seed bead necklaces available are actually glass beads. The effect is very similar to the real counterpart, but offers greater color choices. Josefina De Alba, created and owned by sisters, Karina and Marcela Padilla, who are known for their necklaces made out of luscious Czech crystal beads. The designs are in the traditional Huricholes (Western central Mexican indigenous people) style and come in vivid rich color palettes such as silvers, gold, bronze, black, and various metallic colors. These necklaces are multi-strand and often have a graduated size and color variation that is woven into very attractive designs. Tribal designs and colors are replicated in this exquisite necklace. Some of the necklaces you'll find that have multi-strands are a mixture of textures and metals. This combination of often contrasting textures gives the necklace a unique and interesting look. This is a three-strand necklace of sparkling glass pearls that comes in three distinct colors of light brown, dark rose and light gray. 18 inches in length, the necklace can be extended and additional three inches. You may prefer a multi-strand beaded necklace with a heart motif. If you do, then this necklace is sure to please. It's made out of turquoise stones and nugget-style beads. A heart pendant made out of hammered silver is the focal point of the four strands. The necklace is 18 inches long and the heart pendant is suspended between them, which gives it a romantic flair . Get in the spirit of spring with this fun multi-strand flower necklace. This necklace can be worn with a summer dress or a casual sleeveless top. The flower charms include daisies, open roses and rosebuds alternately spaced between silvertone beads. There are numerous styles and variations of necklaces with several strands. Use Styrofoam wig head busts. Multi-strand necklaces will give add a stylish feature to any outfit.